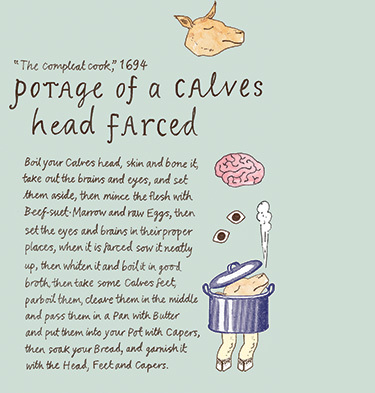 The centuries-old recipes in Wendy Wall’s "Recipes for Thought" reveal gruesome butchery, life-saving concoctions and a sly sense of humor. Could they also illuminate values that look a lot like ones we hold today? Professor Wendy Wall discuses the curious ways women "seasoned" both foodstuffs and human bodies. Move over, Martha Stewart. This is the event that everybody will be talking about. Novel entertaining strategies were just one of the many discoveries that Wendy Wall, professor of English and director of the Kaplan Institute for the Humanities, unearthed while doing research for her most recent book, Recipes for Thought: Knowledge and Taste in the Early Modern English Kitchen. As Wall combed through hundreds of English recipes from 1570 to 1750, she discovered that kitchens during that time were the site of small animal slaughters and home to amateur laboratories where women made medicine with human skulls. Recipe books also helped women learn to read and climb the social hierarchy, and they served as a way to connect to the past. Wall first became interested in food and recipes while teaching Shakespeare’s Merry Wives of Windsor. She was fascinated by what the play said about domestic life at the time — and eager to know more. “I started thinking about what it meant to consider yourself English at this time: to be raised in a certain way, make cheese in a certain way, grow up in a home a certain way,” she explains. Recipes seemed like one of the best — and overlooked — windows into that world. She found collections from libraries around the world — everything from gold-embossed, leather-bound folios to a few simple scraps of paper in a working notebook. It was clear that these collections were anything but ornamental. Well-loved editions often featured scrawled IOUs, Bible verses and doodles in the margins. Wall also found a treasure trove of recipe books in an unexpected place: London’s Wellcome Library for the History of Medicine, which housed manuscripts of recipe collections of the time. The discovery wasn’t as surprising as it might first seem. Recipe collections frequently included instructions for creating medicines for digestive problems or sore throats. Though it may seem strange, vestiges of that thinking persist, like when we prescribe ourselves chicken soup to treat the common cold. “It suddenly made sense to me why so many plays of that period talk with nervousness about having a woman in the kitchen — she might have drugs, she might poison you, she might be a witch,” says Wall. “Your mortality and your vulnerability as a human were on display in the kitchen.”If you think that the kitchen of the time seems less like the friendly confines of the Rachael Ray Show and more like an episode of American Horror Story, you’re not alone. Many well-known playwrights of the time alluded to concerns that they had about the work being done in household kitchens. Lady Macbeth herself mentions poisoning guards’ drinks — presumably with a toxic brew she whipped up in the kitchen. In All’s Well That Ends Well, Helena, a woman and a commoner, insists to a skeptical audience that she can cure the gravely ill French king with a recipe she knows. And she does.The recipes Wall found shed surprising light on cooks and their practices — including cooks’ remarkably strong stomachs. Not only did cooks slice the throats of pigs, chickens and moles in the kitchen, but they also caught the animals’ blood on pewter plates and pulled out their innards. If you were serious about taking full advantage of the animals’ vital spirits, nothing less would do. Recipe writers counseled their readers to treat epilepsy with white honey, or, if they had one handy, a pulverized human skull. Some recipes even advised poking goose quills into one’s nose to cure certain ailments. Fortunately, these early modern English kitchens weren’t always terrifying. They were also home to fascinating social dynamics and comforting connections to the past. Wall found family genealogies inscribed in many recipe books and evidence that the books were handed down from generation to generation. The collections included notes about favorite recipes from family members — a way to declare community, identity and affiliation. (They also evoked moments of seeming passive-aggression, as when recipe writers would share a family recipe and then follow it with an apparently superior variation of the dish “my owne way.”) Still, there’s no question that many recipe writers lovingly transcribed the recipes shared with them by mothers, aunts, cousins and siblings with the idea that their work in the kitchen would have a life beyond their own. This passing down of recipes is a practice we still carry on today, with many of us hanging on to tattered index cards scribbled with family recipes. As it was then, it’s a way to remember, honor and recreate a certain meaningful part of the past.